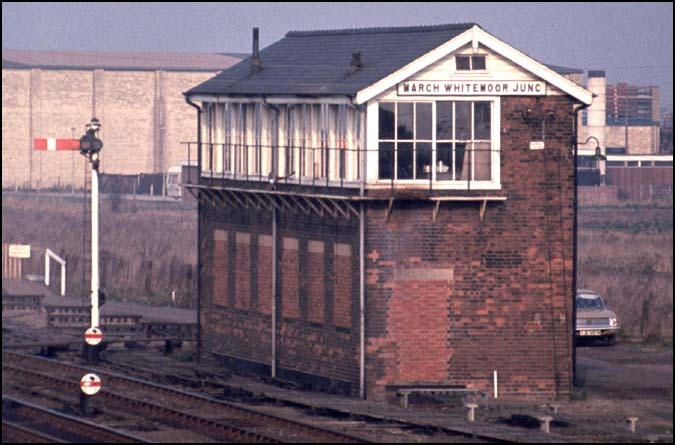 This signal box was called March Whitemoor, together with March North and March West boxes controlled the triangular junction into Whitemoor yard and the Wisbech line and the GN&GEJR line to Spalding. This box closed after the GN&GEJR to Spalding line closed and the Whitemoor Yard closed. Today there is a earth embankment here for the new Whitemoor Distribution Centre that was opened in 2004 here. There are houses behind the new large earth embankment that has been put here to cut down on the noise. All tracks bar the Wisbech line were removed when the old yard closed. March railway station is in the town of March which is in the county of Cambridgeshire in eastern England. The station is 14 miles from Peterborough on the railway line to Ely. March is in the flat fens, were farming was the main industry till the railway came. The GER railway line ran from Ely to March and then to Peterborough is still open.